Aviation training centre BAA Training (Vilnius, Lithuania) has launched series of videos which are produced due to requests of viewers. Aviation enthusiasts were encouraged to participate in creating the scenario for the next video by sending suggestions, ideas or questions. There are already series of videos answering questions concerning aviation training and pilot career, presenting situations as dual engine failure on short finals, describing how to calculate the take-off speed for Boeing 737 and Airbus A320, approaching Manchester in a less usual way, showing engine fire during the take-off roll. Throughout the last video the attempt is made to fight an engine fire in-flight on the Boeing 737-CL. ‘Aviation has wide range of themes which can be explored in many ways. Our intention is to feed the hunger of aviation knowledge and information which makes people closer to their passion and dream. Aviation enthusiasts have already raised huge interest in our videos and we are more than glad to fulfill their field of interest with useful information ‘, commented Natalja Chrustaliova, Communications Project Manager at BAA Training. BAA Training launches a new video on its official ‘Youtube’ channel (http://www.youtube.com/marketingbaa) every week. The videos have already attracted more than 2.3 million viewers and the channel boasts more than 10 000 subscriptions. There are 120 video made based on material exploring various aviation topics and situations in the aircraft cockpit. 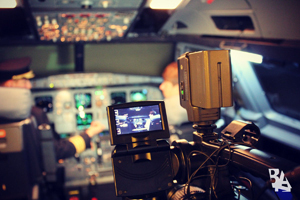 BAA Training invites you to join this video project by expressing your ideas on new aviation topics that you may be interested in by e-mailing your suggestions to info@baatraining.com.